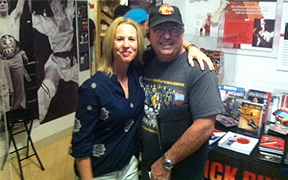 ~~BURBANK, CA – Martial arts authors and dignitaries enjoyed a day of pitching their latest books at the Martial Arts History Museum's third Bookfair event. Listed as Bookfest 3, fans got to meet martial arts icons up close and have their first edition books personally signed. The event, which took place yesterday, October 18, served as a fundraiser to support the Museum. Pioneers of martial arts history made a special appearance which included Doug Wong, Leo Fong (Bruce Lee's close friend), Don Baird, Carrie Ogawa-Wong and Carl Totton. Authors with newly released books included sci fi author Lambert Cheung, publisher Allen Woodman, Buddha Zhen, Al Case and actor Shuny Bee. The museum was lined with the latest works from each author plus a large selection of dvds, t-shirts and vintage magazines in which many of them graced the cover. “The museum also provided a special treat for visitors by having a multitude of old martial arts magazines on sale to include in their collection,” says Matsuda. “I found some old magazines in which I used to write a column for. This will be a nice gift for my students,” notes author Don Baird. The museum's final and special exhibit for this year will include an Open-House ribbon cutting for the new Anime section in the museum. “Anime is such a huge industry and nearly every anime is connected in some form to the martial arts. This will be an exciting event,” adds Matsuda. The Martial Arts History Museum is a non-profit 501c3 organization. It is the only place that preserves the history of the martial arts and its impact on America. Focusing on China, Japan, Korean, Thailand, Hawaii, the Philippines and America, the museum also includes a special section on martial arts in the media. From Anna May Wong, Zatoichi, Billy Jack, the Karate Kid to today's Quentin Tarantino's Kill Bill, Dreamwork's Kung Fu Panda, the Last Samurai and more. It is a place for all to enjoy. In fact, Ralph Macchio's actual headband is on display. “The museum isn't just about the punch and kick, but it is a cultural, educational, historical and fun place for kids to learn about the arts,” concludes Matsuda. The Martial Arts History Museum is located at 2319 W. Magnolia Blvd., Burbank, CA 91506. Mamuseum.com or call (818) 478-1722. Donations and support are encouraged.